Smartphones and tablets are parts of our lives whether we like it or not. We always need a way to stay connected to our work, friends, family, and thus, we need gadgets that allow us to connect to the web. Smartphones are the first choice when it comes to keeping in touch with the world, but tablets are also popular, and it is perfectly understandable since tablets are not only great for communication but also for entertainment. These devices come in handy not only when we have to complete an urgent task for work but also when we would like to watch videos, play games or listen to music. 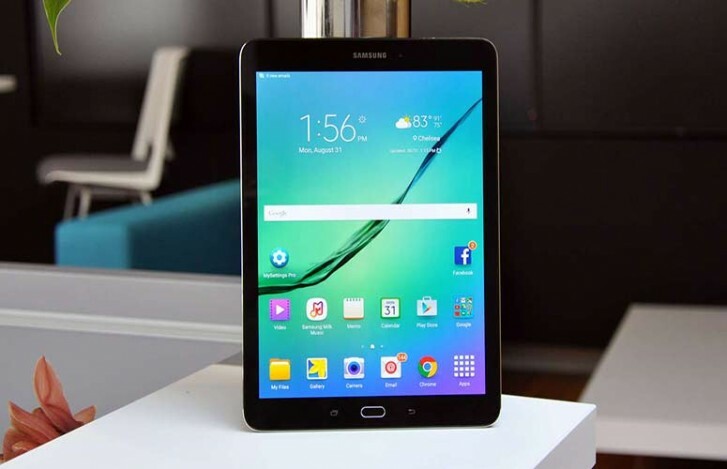 There is a great variety of tablets on the market, but it is safe to say that Microsoft and Samsung devices of this kind are some of the most popular. Today we are going to examine the Microsoft Surface 3 and the Samsung Galaxy Tab S2, which are both tablets that were released this year. This 10.8-inch tablet remained one of the best devices of its kind delivered by the famous software company. Microsoft’s Surface 3 has a 1920 x 1280 pixels resolution and 214ppi pixel density, which makes it perfect for watching videos and for creating a great visual experience. The body of the tablet is made from magnesium and it is really thin, measuring only 8.7mm in depth. The tablet is also quite light-weight given its 187 x 267 mm dimensions, weighing only 622g in tablet mode and 887g together with its keyboard. The thin body and the silver color Microsoft delivers it in turn the Surface 3 into a quite elegant device. The fact that it is light also makes it ultra portable, making it easy for users to work or enjoy their favorite videos, music and games even when they are on the move. 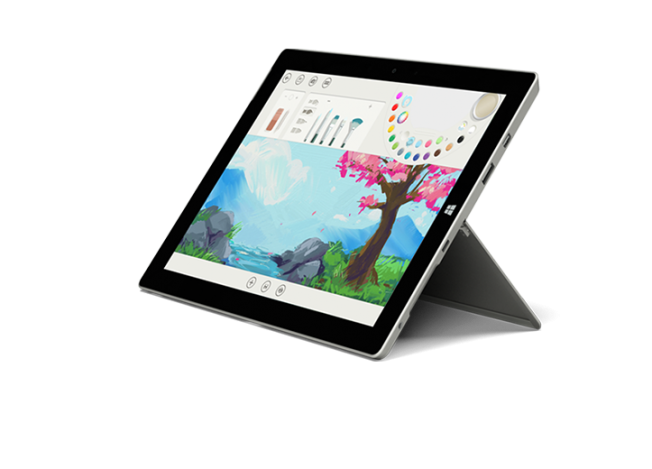 The Microsoft Surface 3 is powered by a quad-core Intel Atom x7-Z8700 processor that can reach as high as 2.4GHz with the Burst technology the device features. The tablet includes 2GB of RAM and 64GB internal storage, which is more than enough for users to store their videos, games, work, music and other content on the device, and also make the tablet work fast and smoothly. The Surface 3 comes with Windows 10 out of the box, so it is the perfect device for you if you often need to complete your work on the go. It supports all Office features, allowing users to use Word, Excel or any other program from the Office suite. The fact that the tablet can be connected to a Type Cover only makes it easier to work on this device. The Surface 3 also supports the Surface Pen, which will feel exactly like a regular pen, making it easy for users to take notes, just like if they were using a regular notepad and a pen. The Surface 3 is equipped with an 8MP back camera with auto focus that enables users to capture high-quality still images and videos. The tablet also has a 3.5-inch front-facing camera which is perfect for video calls and for taking selfies. Video calling also needs a microphone and speakers, and the Surface 3 has them all at hand. The speakers have Dolby audio, so the sound will be rich, full and clear. Just perfect for listening to music, watching videos, gaming and of course for video calls. The Microsoft tablet has a number of sensors that make it work better, like the ambient light sensor, proximity sensor, accelerometer, gyroscope, and magnetometer. The Microsoft Surface 3 is equipped with a battery that is able to ensure up to 10 hours of battery life. The tablet can be connected to other devices given its full-size USB 3.0 port, the Mini Display port, the headset jack and the cover port. The microSD card reader of the tablet can also come in handy, so users will be able to enjoy a powerful tablet that has a lot to offer to make their lives easier. All this can be yours for only $434.90 if you order the device from Amazon these days. The Samsung Galaxy Tab S2 is slightly smaller than the Surface 3. It measures 237.3 x 169mm and is only 5.6mm thick. The tablet is also lighter than the Surface 3, weighing only 389g in the WiFi version and 392g in the LTE version. This is quite impressive for a tablet that has a 9.7-inch display and is as powerful as the Galaxy Tab S2. The display is sharper than the one of the Surface 3, due to its 2048 x 1536 pixels resolution and 264ppi pixel density. The Super AMOLED screen of the tablet will definitely ensure a great visual experience, accurate and bright colors, sharp and clear images. The tablet is perfect for watching videos, and gaming, so users will definitely enjoy it. One feature that the Galaxy Tab S2 has and the Microsoft tablet lacks is the fingerprint scanner which ensures a higher security standard for the device. 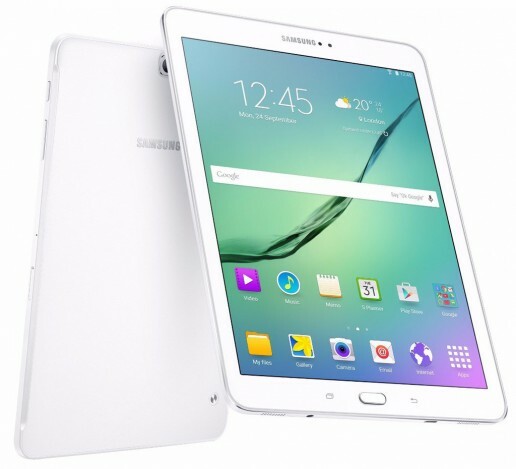 The Galaxy Tab S2 is powered by an Exynos 5433 octa-core processor, four of the cores being clocked at 1.9GHz and the other four at 1.3GHz. The tablet includes 3GB of RAM and 32GB internal storage. The bundle we are referring to today also includes a 64GB microSD card with which users can further extend the storage of the device. The tablet runs on Android 5.0.2 out of the box, which is a little surprising given the fact that at the time of its launching the latest version of the operating system was the Lollipop 5.1. However the software is upgradable, so there should be no issues there. Users will be able to enjoy everything Android has to offer. They can download all their favorite games, movies and other content from Google Play, and enjoy their tablet even more. Those who are planning on purchasing the tablet to help them in their work won’t be disappointed either since they will be able to easily create or edit documents with MS Office solutions. The Tab S2 is compatible with the updated Book Cover Keyboard, so working on it will be just as easy and comfortable as working on the Surface 3. The back camera of the Samsung Galaxy Tab S2 is similar to the one of the Surface 3. It has an 8MP sensor, autofocus, and it is capable of capturing both still images and good quality, 1440p@30fps, videos. The 2.1MP front-facing camera is not as impressive as the 3.5MP one of the Microsoft tablet, but it is still capable of capturing some reasonable quality selfies, and it is also suitable for video calling. The speakers of the Samsung Galaxy Tab S2 are not exactly impressive since maximum volume levels are poor and audio could sound slightly tinny. This is probably one of the worst features of the Tab S2. The device features a fingerprint sensor, accelerometer, gyro, and compass. Battery-wise, the Tab S2 is equipped with a 5,870mAh which can ensure up to 6.5 hours of video playback and up to one and a half day of normal use. Compared to the 10 hours video playback that is ensured by the battery of the Microsoft Surface 3, this is not at all impressive, but it still is quite a reasonable battery life when compared to other tablets. The tablet has a USB 2.0 port, so it can be connected to other devices. It also features an audio jack, so you will be able to listen to music via headphones instead of opting for the speakers of the gadget. 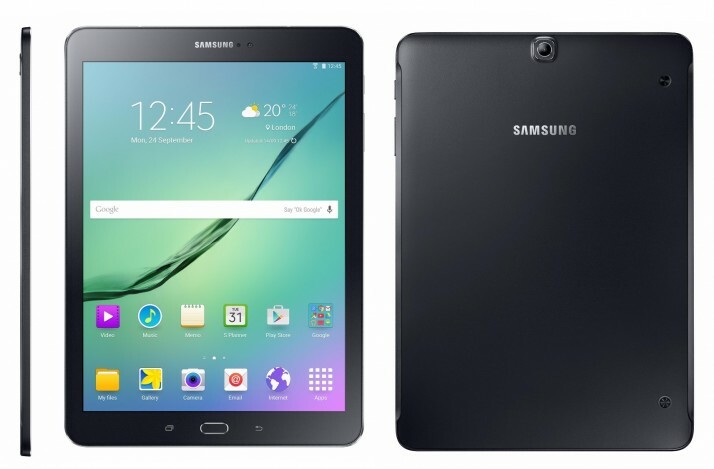 The price of the Samsung Galaxy Tab S2 and 64GB microSd card bundle is $416.99 on Amazon, so it is more affordable than the Microsoft Surface 3. 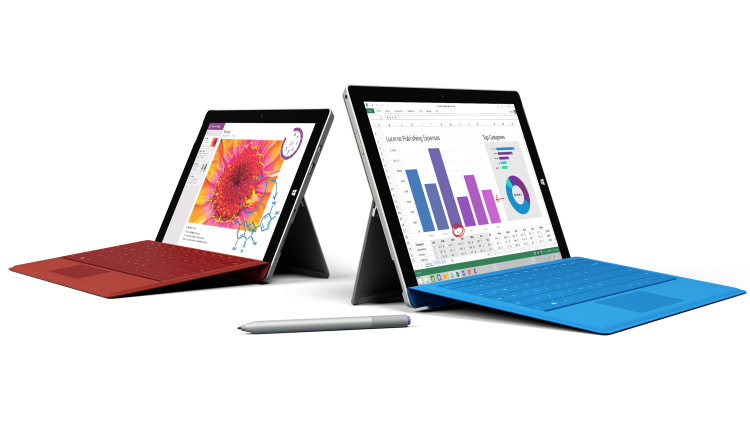 The Microsoft Surface 3 is a great tablet for those who need a device to work on. It offers everything the operating system has best, making it easier for users to complete every-day tasks they would normally have to do on computers. It is powerful enough for the majority of users and it has a slightly bigger display than the Samsung Galaxy Tab S2. On the other hand, the Galaxy Tab S2 is slimmer, lighter, and has a more beautiful display, higher resolution and it is able to deliver sharper images, creating a better visual experience. It also has more memory than the Surface 3, making it faster. The fact that the bundle includes a 64GB microSD card and the tablet already has 32GB internal storage means that in this comparison the Samsung device will win if we consider the storage space the two tablets have to offer. The cameras of the Microsoft tablet are better, but then again, the majority of people don’t choose their tablets based on the cameras they are equipped with. If you wish to have a tablet that is light, slim, and good-looking, the Galaxy Tab S2 is the best choice for you. It is also more affordable, so it could be the first choice of many people. 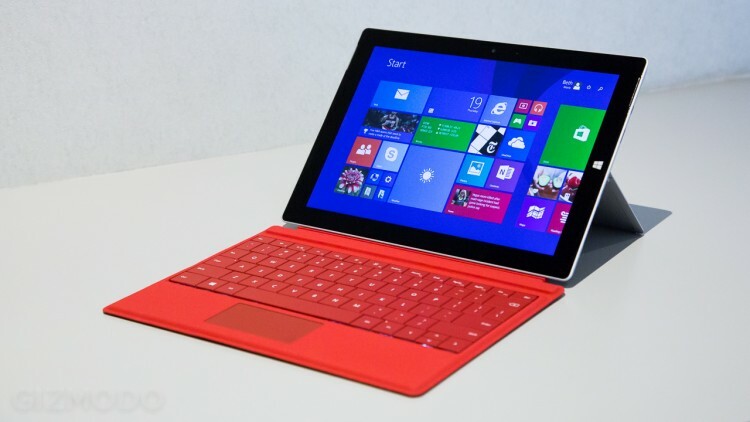 However, the type cover of the Microsoft Surface 3 is more comfortable to use and it is more suitable for work. The sound quality delivered by the Surface tablet is also better, making the device more appealing than the Samsung one. To be honest, it isn’t an easy choice to make, and it really depends on what you plan on using the tablet for, because both devices are high-quality, and they both have their pros and cons against each other. The operating system can also be the feature that helps you choose. If you prefer to have Android on your tablet, opt for the Tab S2, if you like Windows 10 best, the Microsoft Surface 3 is the one for you. You can choose either one and still have a great tablet.